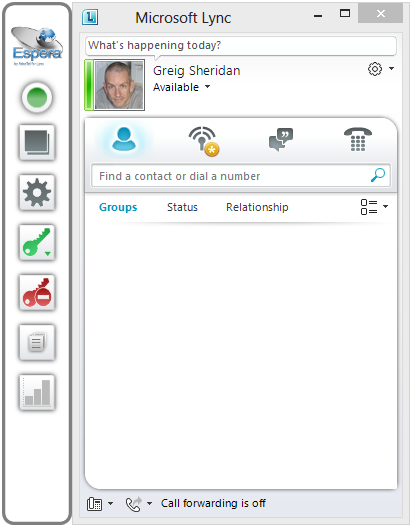 Lync’s Response Group (herein “RGS”) is a great entry-level hunt group and small queue / contact centre application. Out of the box (and included free with every Lync!) is lots of functionality that you can turn on and off on a per queue – or in Lync parlance, “workflow” – basis, including time-of-day, day-of-week & public holiday opening hours, recorded announcements, text-to-speech messages and even a multi-level speech-reco(!) 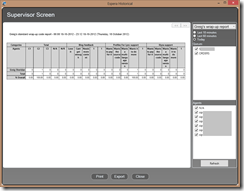 IVR / auto-attendant / voice menu. There are also overflows based upon time in queue or number of callers – but I think you get the idea. One of the Response Group’s shortcomings is the real-time visibility is “poor”, as is the historical reporting: the latter being limited to either 1 (or possibly 2) canned reports. I guess that Microsoft focussed on call handling – getting the calls to the agents, using an in-built queuing engine – and left “others” to add extra value on the user’s desktop. 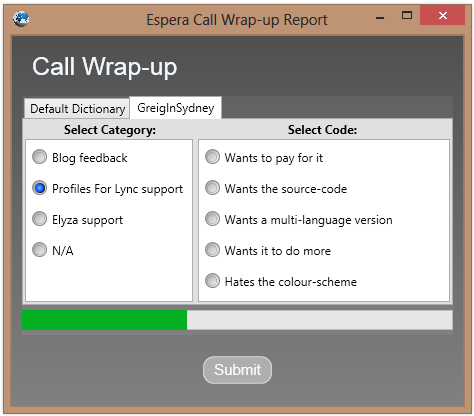 This is where Aussie software developer AdvaTel has stepped in and released “Espera” [Spanish for ’waiting’]. 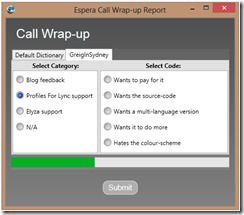 Espera is a client & server app combo. The server-side resides on a server configured in the Lync Topology as a trusted application server, reading RGS data directly from Lync’s databases. It then cleverly sends this information to the client-side app through a permanently-established IM conversation. (More on that later). 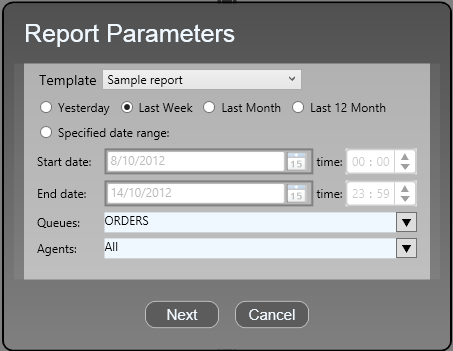 There are two flavours of Espera: Real Time, and the new Reporter add-on. Espera Real Time has been around for a while now. 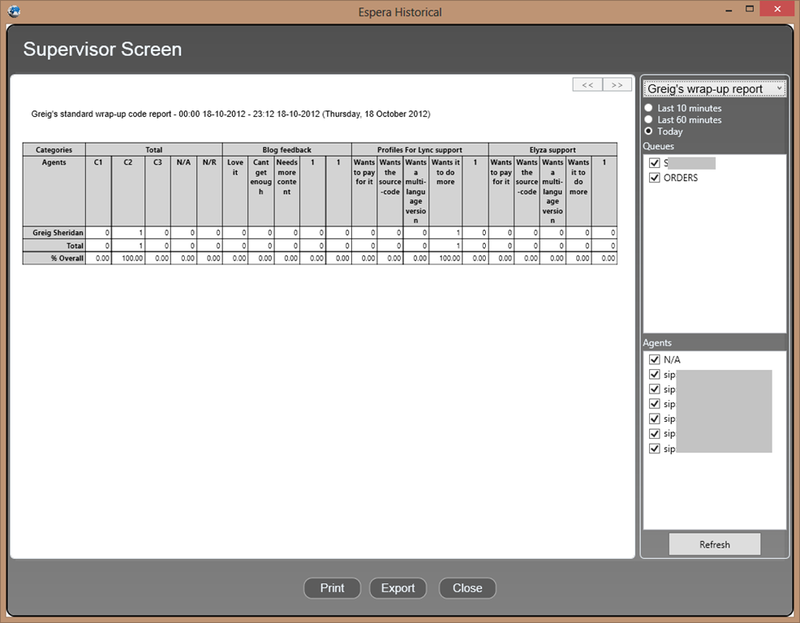 It provides a very familiar on-screen call centre “wallboard” or “agentboard”. Customise the view for each agent or team, set the colours to change when thresholds are exceeded, re-size it (from vast to tiny), etc. In the above image I’ve hovered over the “Agents Logged in” and it tells me Greig’s logged in – but he’s busy. (The brown border is courtesy of Windows 8 BTW). The supervisor or administrator can also broadcast messages to the wallboard of just one agent, or to a group. The wallboard can be docked to either the top or bottom of the screen and it won’t be over-written by any other application when they’re maximised, ensuring the wall-board’s status and its messages are always visible. Another great feature in Espera is that it lets agents in Formal response groups log in and out at the press of a button – sparing them the tedious trip to the Response Group Settings web-page. (Those are the two “key” buttons in the Espera “side bar” below). With the latest build the side bar becomes optional: just right-click the tray icon to show or hide it as required. And of course anyone can run Espera – you don’t need to belong to a queue to see how it’s performing. 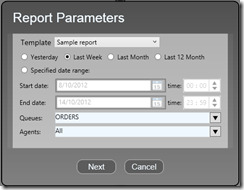 Reporter is the latest addition, and they’ve clearly been busy back-of-house, in some cases calculating custom reporting fields to fill in some of the gaps in the information captured by Lync. Post-call wrap-up codes. This box pops after the agent has hung up the call, and the agent is held in a Busy state for a configurable period or until they’ve chosen a call type/code from the pick-list. … and more – but I think you get the idea! 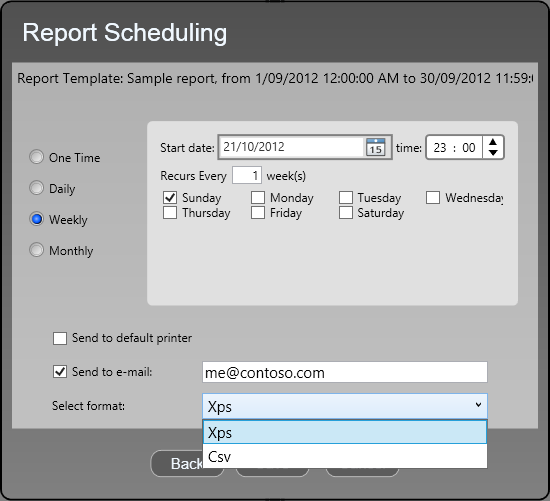 There’s also a Supervisor Screen, which lets you run any of the reports instantly, accessible with a single click. 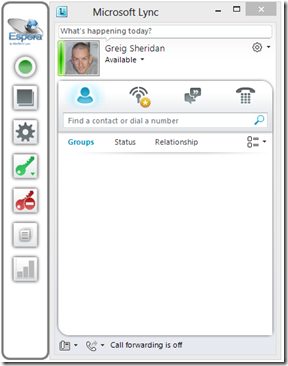 (This is the bottom icon in the side-bar in the earlier image of the Lync client). At the top of the right-hand column is the pull-down list (currently showing “Greig’s wrap-up report”), and underneath that three radio buttons: Last 10 minutes, Last 60 minutes, Today. Note you can refine this in real-time by selecting/de-selecting Queues or Agents, and clicking Refresh. 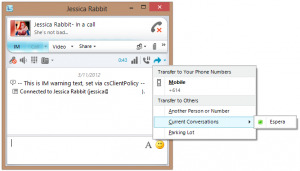 Espera runs on a server that you’ve created in Lync as a trusted application. The server can’t be used for an existing role in the Topology, so you can’t co-reside it on an existing Front-End server, as you might with some UCMA apps. (This changes in Lync Server 2013 – “You can collocate a trusted application server with the Front End Server”). Espera uses a Lync account for the underlying transport between server and clients. Using Lync as the transport between the server and clients means you don’t need any special firewall holes – it just works, even for remote users signed-in through the Edge! It’s also visible in your Conversation History folder too. The fix is simple enough: AdvaTel’s included an alternate TCP communication path that prevents either of the above messages popping. The downside is of course that you might need to add some extra firewall rules. I think AdvaTel’s found themselves a great niche here. Rather than inventing a new routing engine of their own (like Geomant, prairieFyre and others have done), they’ve strategically left the heavy lifting to Microsoft, all still taking place inside Lync, and added the client-side and supervisory / administrative interface that the RGS lacks. Some of the Reporter output is a bit buggy – but I’m playing with a Beta build. (The GA release will be out soon). At the moment it doesn’t report calls at the Workflow level (only after they’ve dropped through to a queue), so you might need to reorganise your call flow structure to maximise the reporting benefit. 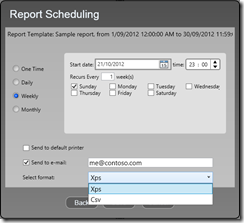 It is hoped that Workflow reports will be added in a future update. Its requirements aren’t high and my customers to date have found it very favourably priced. It installs in next to no time, the installation PDF is very detailed, and AdvaTel also provides an assisted installation option. AdvaTel kindly provided me with a licence for Espera. You can download a demo version from their website, and if you’re still wanting to try before you buy, they even have time-bombed trial licence keys. If you have a spare 3 minutes, there’s a great demo on YouTube.